Easy Garlic Parmesan Pretzels – The recipe for these garlic parmesan pretzels couldn’t be any easier! You just toss store-bought pretzels in garlic powder, Parmesan cheese, dried dill, and a little oil and baked for 30 minutes! You’ll have a fun, homemade snack in no time! Snacks are my favorite. I have spent many nights snacking on a little of this and a little of that instead of committing to a dinner to make. I can’t help where my taste buds take me! So are you surprised that here I am, with yet another snack recipe?? These garlic parmesan pretzels are so super easy to make. What makes them easy, you ask? They’re made with store-bought pretzels and take only 30 minutes to transform into the flavorful garlic parmesan beauties. You’re going to be making them every chance you get, especially if you don’t want to put in the work to make soft pretzels. I am a sucker for a great soft pretzel but sometimes you just don’t have time to whip them up. Okay we talked about how easy these garlic parmesan pretzels are to make. Now, let’s talk about they taste. Talk about a one, two punch of flavor! When you take a bite, the garlic is obvious to pick out. But there’s something else. Yes, parmesan. Duh. But something else, too. But what is it? Have you used dill before? Probably not. I rarely use it. But if there’s one thing that uses it is ranch dressing. So that’s the flavor you taste. A hint of ranch flavor. When you combine the garlic, parmesan, and dill together, you get a little ranch kick that is phenomenal. So. Much. Flavor. You’re gonna be obsessed with these pretzels – just like I am. I cannot wait to try this seasoning on different crackers and pretzels. Or even popcorn! Yummm. I used sourdough nibbler pretzels for this recipe but you can easily use 1 pound of any other pretzel that you like: sticks, twists, you name it. I plan to try this recipe with cheese crackers. Stay tuned for an update on how they turned out! This recipe calls for canola oil to toss with the herbs, cheese, and pretzels. Canola has less saturated fat so that’s why I like using it for this recipe, especially since we use 1/2 cup of it. Olive oil is even better for you but it has too much flavor for this recipe. Canola oil has a neutral taste so that’s why I use it here. Dried dill is also know as dill weed, just in case you get confused in the spice aisle. This happened to me the first time I bought it. Do not use fresh herbs or garlic for this recipe. They won’t coat the pretzels properly. Plus, the measurements will be totally off. Let me know how you like these pretzels! What other snacks are you feeling this month?? I am always looking for new ways to satisfy the cravings. Let me know in the comments below! 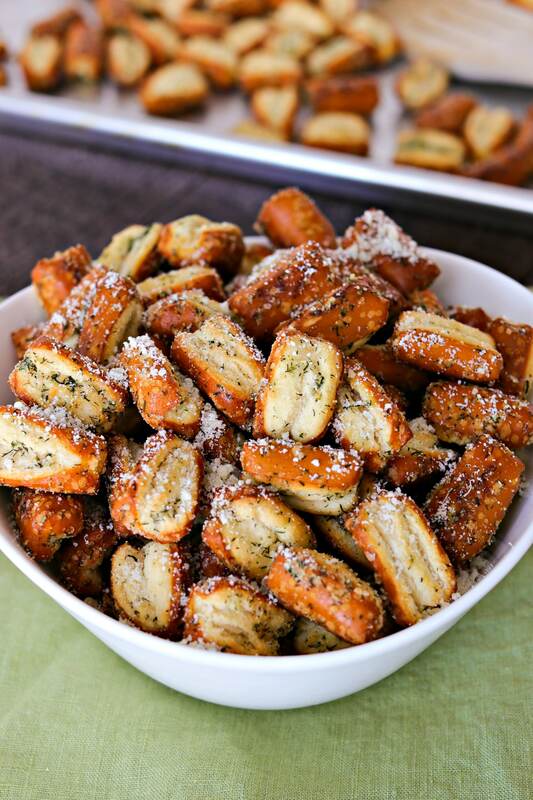 The recipe for these garlic parmesan pretzels couldn't be any easier! You just toss store-bought pretzels in garlic powder, Parmesan cheese, dried dill, and a little oil and baked for 30 minutes! You'll have a fun, homemade snack in no time! Add all ingredients to gallon storage bag. Seal bag. Toss until even coated. Place coated pretzels onto baking sheet in one even layer. Place in preheated oven and bake for 15 minutes. Remove from oven and toss around to rotate pretzels. Bake for another 15 minutes. Remove from oven. Let cool for 5 minutes before serving. Add a little more Parmesan cheese for presentation, if desired. Enjoy! YUMMY!!! I just made these are they are outstanding! Thank you for sharing this delicious and extremely easy recipe! Aw you are so welcome! SO glad you liked them! This looks so yummy. I’ll have to try it out! These look scrumptious! I am also a big snacker and am excited to add this new snack to my rotation! This recipe is phenomenal, Sharon. I really enjoyed the garlic flavor. These look so delicious!! I’m such a sucker for garlic and parmesan! I just love this transformation! That garlic — yum! Fun for a gathering or on movie night! These are delish! I got to sample them myself!! Thanks for the love, Matt!! These look absolutely amazing!! I’m going to have to make them for our next movie night! Oh, my goodness…. NOM NOM NOM. These look so good! Thanks so much for sharing–these look perfect for football season–and they don’t look too difficult to make. Score! Omg these would be perfect for a game day snack! My fiancé would go nuts for them! What a great appetizer! I love pretzel snacks! holy moly these look amazing! I LOVE anything with cheese are garlic on this. These would be great for game day! Pretzels are one of my favs and anything with garlic is good to me! Need these in my life! They look fantastic and super yummy! I am gonna try them for sure! My husband loves pretzels. I need to make this for him. You had me at garlic!! I always buy the pre-seasoned pretzels, but this is such a better idea. I can control what ingredients go in it! Exactly! And you can switch around the cracker or pretzel. I am so excited to try this seasoning with Cheez-Its! OMG! I cannot believe my eyes that pretzels can look soooo tempting and mouth watering. I have never made pretzels at home but your recipe has made me excited to try it. This is the easiest recipe you’ll ever find since you’re using store-bought pretzels! These look so good and would be perfect for a Game Day snack! Great recipe. I’ve really been into making pretzels lately. But they aren’t something you whip up quickly. You definitely need time to make them. They would make a great Super Bowl snack. Can’t wait to try them. This is my kind of snack and perfect for Super Bowl! Will definitely give this a try. These look like the perfect game day snack! Yum! Yum yum, I love pretzels and garlic so this looks delish! Need to try this asap! Parmezan and garlic. Two of my favourite things in the world. Yum! That looks so good! I have to try this at home! Oh my goodness, these look fantastic! So many fun things you can do with these. Oh my goodness — these little babies look amazing! I pinned so I can make these the next time we have game night and I’m looking for a snack to serve. I’ve made something similar to this before, but it involved leaving it in a ziploc bag overnight. They look good! I love making homemade pretzels. They are so easy and good when they are fresh. Mine never look as good as yours. Love the flavor! I recently made pretzels, but they didn’t look nearly as good as these. Would love to give your recipe a try. These look amazing! !